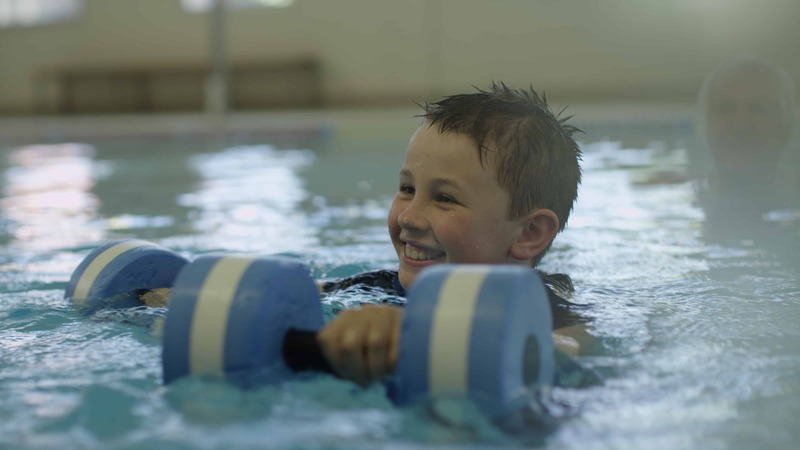 Hydrotherapy is used by many Physiotherapists to treat a wide range of conditions. The warmth of the water helps muscle relaxation and pain relief, whilst the buoyancy of the water may be used to assist or resist joint movements, minimising the compressive forces of gravity. After an assessment by a Physiotherapist, clients undertake individual hydrotherapy sessions followed by supervised group classes. James* has Spina bifida his main complaint was tripping whilst walking and running, low muscle tone as well as fatigue. On assessment, James* showed poor joint stabilisation, motor control in his trunk muscles and weak lower limb strength. He was struggling with his proprioceptive system, meaning that it was hard for him to understand where his body was in space, leading to trips and falls. James* was also experiencing issues with foot clearance and lower extremity dissociation making it difficult for him to walk. We started James’s* hydrotherapy program in different depths of water. This helped improve his proprioceptive system, reducing the number of trips and falls. He was given exercises that involved small but quick movements starting from the trunk, challenging him to hold his position improving his neuro-muscular sustenance. James* was also given stability exercises that were followed with mobility and lower extremity strength training, helping him to clear his foot well when walking and running. The use of assistive devices such as fins also helped with his recovery. James* can now walk and run without any issues. He does not seem to get fatigued as easily and loves exercising in the pool. He has been given orthotics to help to correct issues that he has been experiencing with the length of his limbs. His understanding of where his body is in the space around him has also improved. Contact your local Core Physio to find out more about Hydrotherapy.